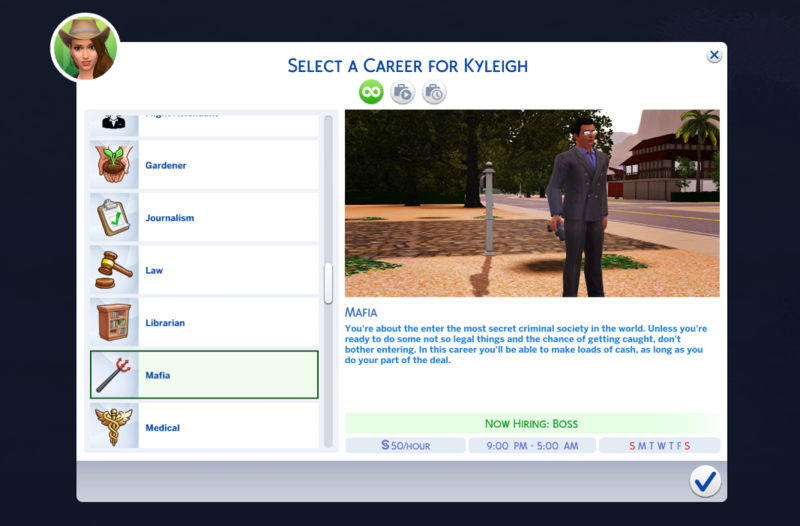 by tumblrpotato Posted 8th Jul 2018 at 2:48 PM - Updated 16th Dec 2018 at 12:30 PM by tumblrpotato : Career is updated for Get Famous! Download the latest zip! 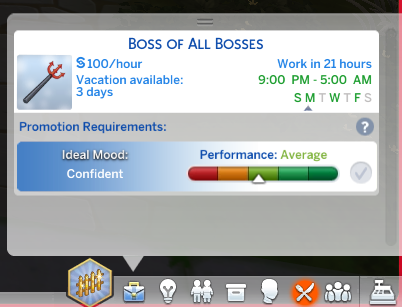 This career works with the latest game update/patch: Get Famous! There is a zip for those who have the latest game update and for those who don't. You're about the enter the most secret criminal society in the world. Unless you're ready to do some not so legal things and the chance of getting caught, don't bother entering. In this career you'll be able to make loads of cash, as long as you do your part of the deal. With this mod, you'll be able to advance in the Mafia Career and have the change to be the Boss of all Bosses. You'll have to upgrade skills such as Logic, Charisma, Mischief, etc. I made only 7 positions but, if this once is appreciated, will make more and branches as well. Thank you for downloading and have fun! Associates are not actual members of the Mafia but rather anyone who teams up with them on a criminal enterprise of some kind. They could be someone who does business with the mob, including money-laundering bankers, crooked cops, lawyers, politicians, drug dealers, etc. There are also the Italian newcomers who have yet to be made, called cugines, and they play a minor role in the operation of the Mafia. The lowest-ranking members of the hierarchy of the Mafia and La Cosa Nostra are the soldiers, the grunts of the organization who do the majority of the “dirty work.” It’s the place where the kids start off: running errands, making deliveries, picking up cash, and generally sticking out their neck in the hope of making a name for themselves by demonstrating their loyalty to the organization. The capo, or caporegime, is the captain or lieutenant of a division within the Mafia. He heads a crew of soldiers and reports directly to a boss or underboss, who hands down the instructions. He ranks much higher in the hierarchy of the Mafia. The consigliere, or chief advisor, is not officially part of the hierarchy of the Mafia, but he plays one of the most important roles in a crime family. He is the close trusted friend and confidant of the family boss. The function of the consigliere is a throwback to medieval times, when a monarch placed his trust in an advisor whom he could summon for strategic information and sound advice. The consigliere is meant to offer unbiased information based on what he sees as best for the family. He’s not supposed to factor emotional concerns, such as retaliation and blood feuds, into his decisions. Unlike the underboss (see below), the consigliere is not required to be a direct relative of the boss. Instead, he is chosen solely for his abilities and the amount of knowledge he possesses. Generally, only the boss and underboss have more authority than the consigliere in an organized crime family. The underboss, or capo bastone, is second-in-command in the hierarchy of the Mafia crime family. His level of authority varies from family to family, but he is ready to stand in for the boss at any given moment. In the violent and volatile world of the mob, the underboss can easily find himself at the helm of the family so, for the most part, they are usually groomed for an eventual takeover, particularly if the boss’s health is failing or if it looks like he’s headed for a stay in the joint. The boss, or capo famiglia, makes all the important decisions, much like a CEO of a company would. Although each mob boss may run his outfit in a different way, they have one thing in common: they are greatly respected and widely feared by their subordinates. All of the men in his outfit pay him a tribute, so he is also usually an extremely wealthy man. There is one more position above the Mafia boss known as the “boss of all bosses” or the capo di tutti capi, although this role has not been filled in the American mob since the 1930s (by Salvatore Maranzano). He was the man who introduced the structure of the five main New York families who would control the criminal underground, with himself, of course, placed at the top. Following his assassination, the position of “boss of all bosses” was eliminated and has never been reintroduced, most likely due to the antipathy it generated among competing families and their bosses. These days the position is merely a de facto title bestowed on the boss of the most powerful crime family which, from the late 1960s to the 1990s, was the Gambinos. Unzip and put in your Mods Folder.